I started Exploring Tampa to suggest new places for people to go. I never thought there would come a day in which I would be asked my opinion on a place before someone checks it out. Alas, it's 2018, and here we are. The future is now! Stormy and I were planning on going to The Bodega a while back and it ended up raining. And by raining I mean downpouring. I had called The Bodega to see if they had any inside seating and I was told that they had like four indoor tables and they couldn't guarantee they'd be available. I wasn't about to bring my camera into that type of environment. 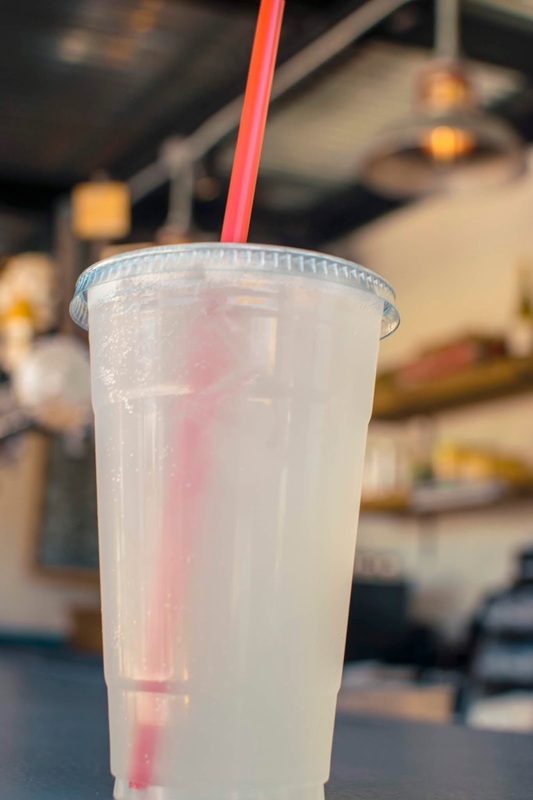 I found myself driving around Seminole Heights the other day and passed Bodega, remembering that I had a request to review it and I decided to stop in. I was a bit early, so I waited until they opened. That said, I was one of the only people there. I went for lunch on a Thursday. 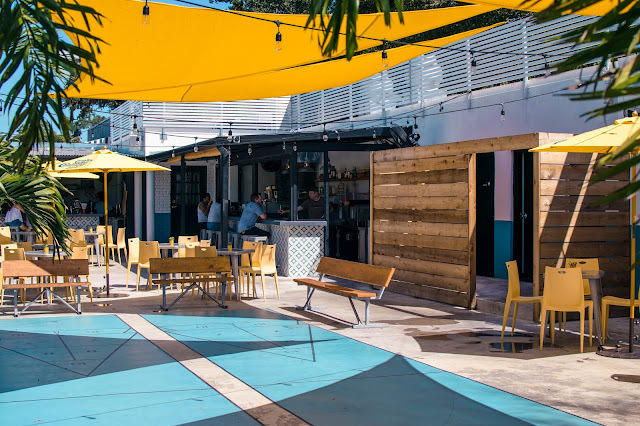 I can't vouch that it will always be this dead, and the bartender (Jason) informed me that a lot of people show up on Fridays to play shuffleboard, which is apparently the new activity in Seminole Heights. But you didn't come here for that! 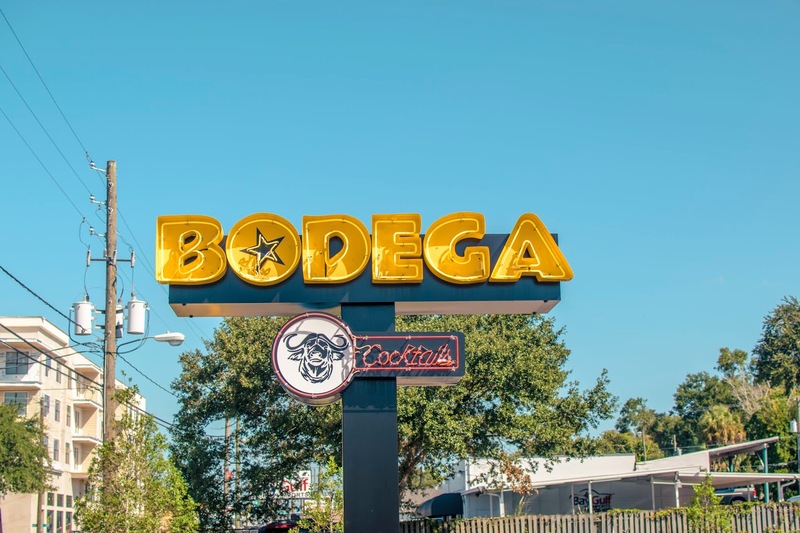 So, Jason had informed me that the Bodega is another concept from St. Pete that moved opened a second location in Seminole Heights and they partnered with another St. Pete bar (that's open next door) to secure a liquor license. Let me state that this is one of the few places in Seminole Heights with a parking lot. During lunch, there is no shortage of seating, though I can see seating being a big issue during peak hours and busy nights. There are two shuffleboard courts, though I don't understand the appeal right now. The shuffleboard is free, as opposed to another shuffleboard place that charges "$12 a person an hour." I'm not sure what place that is. I did not go inside to see the seating they had there, so I can't vouch for how small it is. I can say that they have one bar for beer and fresca, then another bar for liquor. The one constant about this place is that everything is very small. Lets start with the least impressive part of my experience and work my way up: I did not like their food at all. Let me start with their, ahem, "Cuban" they put on the menu. It's 2018 and it's apparently too difficult to Google where the Cuban was invented and what's on it. They do a "Miami Cuban," (Read: Fake Cuban)... In Tampa. Ybor City predates Miami, a Cuban sandwich wasn't invented in Cuba (as every sandwich made in Cuba is considered a "Cuban sandwich," there'd be no reason to call it a "Cuban sandwich" in Cuba! 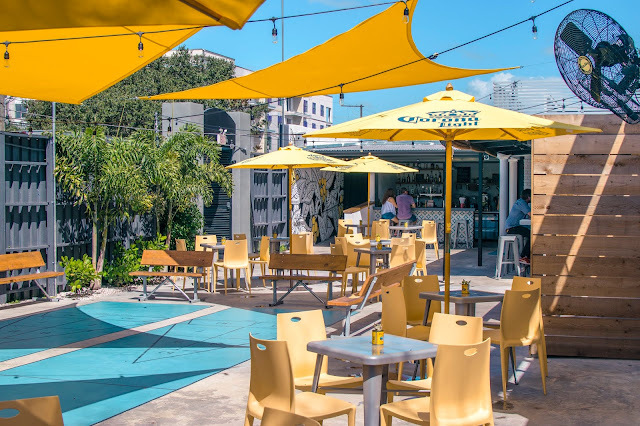 ), and the Cuban sandwich was named by the Italians that came to Tampa and asked, "Hey, what are those sandwiches those Cuban boys are eating?" The fact that you'd come to Tampa, birthplace of the Cuban sandwich, and disrespect the sandwich by putting that on your menu speaks volumes. So, I obviously didn't get their ham and pork sandwich, I decided to go with the lechon. Lechon being roast pork with onions, with a side of white rice and black beans, and plantains. I was told that the fresno chili on top was pickled, which cut down on the heat. That was a lie. The pork itself was on the dryer side, but had a nice citrus flavor to keep it bearable, however the onions were overpowering and I'm not really sure why they used so many. 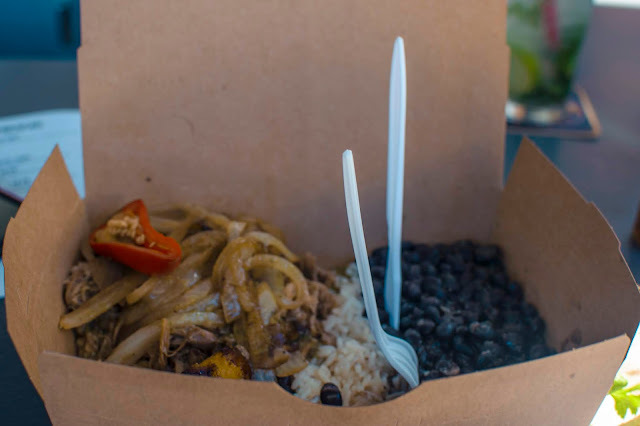 The white rice and black beans were literally just there, they had no real flavor to them at all, and I felt the same way about the plantains. Luckily their food is cheap, so I can't complain too bad. I have been to many places over the years and had many mojitos. I've had many (many) bad mojitos. When I was told that the liquor bartender made a killer mojito, I was skeptical at best. I had no reason to be. This mojito is one of the best I've had in Tampa. For as unauthentic as their Cuban is, their mojito makes up for it. 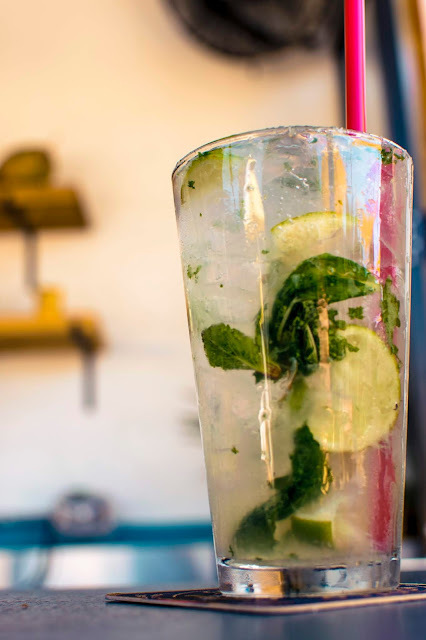 The mint isn't overpowering, there's enough lime flavor to actually taste, and there's enough rum to give it a bite. If there is one reason to go to The Bodega, it's their liquor bar. - This is a total hipster hangout. Cheap eats, homemade soda, cheap macro beer you can drink ironically, and shuffleboard. - The menu is very small. I think, in total, there were nine items on it. - For as bad as the food was, the bartenders and staff were all really cool. The drinks were also much better. - There is a parking lot. One of the few Seminole Heights places that does have one. Are you just as annoyed as I am about fake Cubans? Is shuffleboard your type of sport? Leave a comment below. If you'd like more information on Tampa, check out my YouTube Channel and if you'd like to support my efforts, don't hesitate to buy a shirt from our Spreadshirt (we have new designs!). Also, don't be afraid to click subscribe and you'll instantly be notified whenever a new entry is posted. Thank you all and I will see you next time!